At BYU, the starting quarterback is the Big Man on Campus and Provo’s top celebrity. How is freshman Zach Wilson dealing with it? Provo • Having grown up a University of Utah football fan while also emulating his favorite professional football quarterback, Green Bay Packers star Aaron Rodgers, Zach Wilson wasn’t fully aware of what it meant to be the starting quarterback at BYU when he arrived in Provo last winter. More people ask him for his autograph. Fellow students whisper and nod in his direction in class. People occasionally interrupt him at dinner with congratulatory words. He was even recognized by fans when he attended rival Utah’s game against USC last week. 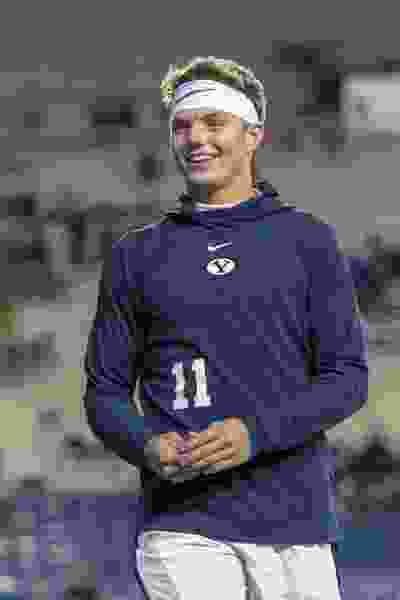 “But it is not as crazy as I thought it would be,” Wilson said Wednesday, 11 days after he became the youngest player to ever start at quarterback for BYU. Wilson, who turned 19 in August, will make his second start Saturday when BYU (4-3) plays host to Northern Illinois (4-3) at LaVell Edwards Stadium. The Huskies have a much better defense than Hawaii did and a lot more game film on Wilson to study, so the freshman knows the level of difficulty will increase immensely. “It will be a good challenge for us on how well we execute, how well we pick things up, how tough we are and the kind of team we really are,” he said. Wilson acknowledged that his life off the field changed Oct. 7, when he learned he’d start against Hawaii. But he has vowed to remain the same person and work even harder at practice and in the film and weight rooms, if that’s possible. Two days after Wilson got the starting nod and as word gradually leaked out that he was new Big Man on Campus in Provo, his cell phone beeped continually with words of support, congratulations and advice from his friends and family members, many of whom are or were Ute fans because his father, Mike, played defensive tackle for the Utah and the family still has season tickets. Wilson wasn’t even aware that his mother, Lisa, posted a video on Twitter the other day from last Christmas, a week after he signed, in which family members sang the BYU fight song at a party in a show of support. As for all the recognition around town, Wilson says “people do make a bigger deal out of it than I think it is,” but appreciates the notoriety and is learning to deal with it. As for Mangum, the former BMOC, he spoke glowingly of Wilson on Wednesday, saying he is not surprised that his roommate on road trips played well against Hawaii. Quarterbacks coach Aaron Roderick and offensive coordinator Jeff Grimes said Wednesday that the move was made because the Cougars weren’t scoring enough points. Grimes likened the situation to a basketball team where the point guard may be shooting a high percentage and avoiding turnovers, but the offense isn’t running well enough through him. Roderick said the decision wasn’t easy and he lost sleep over it. He was impressed with Wilson’s poise and pocket presence against UH, but also knows that NIU presents a bigger challenge defensively. Having made the switch, coaches will be patient with Wilson and allow for some freshman mistakes, Roderick said. “I don’t ever want guys to feel like they have a short leash,” Roderick said. “I mean, you can’t play quarterback if you feel like the first mistake you make you are out, and the next guy is in. We definitely don’t ever want to have a musical chairs situation going on. Guys have to play with confidence, and they have to know they can play through a mistake. And that’s not an easy balance to make. Now if Wilson can play like Aaron Rodgers, that’s all the better.